Almost three years ago I backed a Kickstarter project called ISS-Notity that promised to create a little box that’s sole purpose would be to sit on a desk and light up whenever the ISS was passing by. I gave up waiting and decided to build my own. The device uses software that I have written using the Python programming language. All the predictions for overflights are calculated on the device with the help of an astronomy library called PYEPHEM along with some super complicated (to me) math work that I had to figure out by myself (I had to really dust off my geometry skills too) . As the orbital elements for the ISS change quite frequently the software downloads updated orbital elements from the internet every week or so. 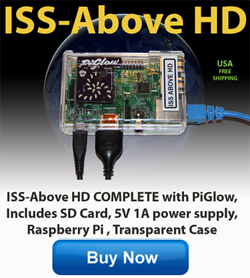 The development of ISS-Above has progressed amazingly well and the full solution now has lot of additional features.